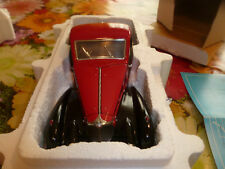 Franklin Mint 1936 Bugatti Type 57SC ATALANTE 1:24 Diecast Red B11RP48 Condition: Adult Collected. Display one in case. Excellent Condition. Beautiful Car! Payment is expected within 2 business days. Thank you for visiting. The 1936 Bugatti Type 57 SC. Franklin Mint 1:24 scale Precision Models. Franklin Mint "Dear Collector" letter:YES. SOLD AS IS. Appears to be in great shape, though there is a small paint flaw on roof (blue arrow in photo) and the back windows (split window) seem to be missing. 1924 Bugatti Type 35 Race Car 1:24 1/24 Franklin Mint Precision Diecast Rare Condition: Adult Collected & Owned. Display Only in Case. Excellent Condition. Hard to find Model. Payment is expected within 2 business days. Thank you for visiting. 1936 BUGATTI TYPE 57SC. FRANKLIN MINT. 1/24 Scale DieCast Model by FRANKLIN MINT. Material DieCast. Scale 1/24. MINT - The item is in perfect condition. NEAR MINT Condition model - Previously displayed. GOOD Condition box. The RM Toys Team. The BOX is in FAIR condition. In 1913, Ettore Bugatti vowed to produce a motor car that would be above all criticism. It was big (spell that HUGE), with a massive in-line eight cylinder engine and an incredibly smooth ride, attributable to its 15 ½ FOOT wheelbase. 1936 Bugatti Type 57SC Franklin Mint Diecast Model. Excellent condition, original packaging included. Part of estate collection, see my other listings for additional items. Brochure For Color Brochure folds out to 11.75" X 19.5". Franklin Mint. 1:18 scale. 1:24 scale diecast cars and trucks, paperwork and brochures. Includes the following unless otherwise requested. 1930 BUGATTI ROYALE COUPE NAPOLEON BLACK AND BLUE FRANKLIN MINT 1:24 DIECAST WITH DISPLAY CASE 2002. 1930 BUGATTIROYALE COUPE NAPOLEON CAR COMPLETE. REALISTIC CAR DETAILS INCLUDE BLACK AND BLUE EXTERIOR. 1/16 Bugatti Royale coupe de Ville 1931. Includes original styrofoam and original Box and accessory - roof top. Parcel Select over 16 oz. Priority or Priority flat rates. HERE IS A FRANKLIN MINT 1:43 SCALE BUGATTI ROYALE CAR. NEARSIDE REAR WHEEL HAS SEPARATED AND NEEDS GLUEING ( SEE PICTURE ). A SIMPLE REPAIR. Bugatti Royale 1930. The Franklin Mint. most seem to have been filled in but could be redone more professionally. Highly detailed model. this model is hand assembled and finished to the highest standards of quality. Franklin mint 1929 Bugatti Royale boxed 1:24 scale. Franklin mint 1929 Bugatti Royale boxed 1:24 scale.. Condition is Used. Dispatched with Royal Mail 2nd Class. 1/ Scale Model by FRANKLIN MINT. MINT - The item is in perfect condition. The BOX is in FAIR condition. EXCELLENT - The item will have had very careful use, with only small imperfections. GOOD - The item will have had more use, showing obvious imperfections. (as per photo's) along with a detailed diagram of the model on the last photo. We no longer have the box or paperwork, the car is dusty but is in overall good condition for the collector. All car doors and the bonnet open. This model has opening doors, opening bonnet with detailed engine, opening boot / trunk. front wheels steer and roll. Scale is 1/24th. Sold as seen the the photos. ( more photo are available ). Very well detailed has opening doors, opening bonnet with detailed engine, front wheels steer and roll. lift off hood, opening dicky seat / rumble seat with lift off rear screen.elephant mascot on the radiator grill. Franklin Mint Precision Models 1930 Bugatti Royale Coupe Napoleon Die Cast Model. Condition is Used. Dispatched with Royal Mail 1st Class. Franklin Mint 1924 Bugatti Type 35 Race Car In excellent condition New in box TERMS & CONDITIONS OF SALE Free carriage and quoted delivery prices are for England Mainland only, (all of England, Wales and Southern Scotland). Ireland, Scottish Isles & North Scotland are not included and will incur extra charges for delivery. Sorry, but I get charged MUCH more for these areas and we already only pass on what we get charged. For any other areas please contact us for a price before bidding. A Franklin mint scale model of a 1936 Bugatti type 57SC Atlantic. Well detailed, opening doors. opening bonnet with detailed engine, opening boot, The front wheels steer and all roll. Near mint condition. Very rare Franklin mint 1:24 scale 1929! A Franklin mint, 1930 Bugatti Royale coupe Napoleon. part of the mascot looks to be missing. Scale is 1/24th. This model has opening doors, opening bonnet with detailed engine, The front wheels steer and roll. Condition is Used. It is seriously one of a kind. I have even added sun visors which also can be pulled out easily and what is seen on photos that is what it is. A Franklin mint model of a 1936 Bugatti Atlantic type 57 SC. Condition MINT and Complete. Original Box and Paperwork. Car model Bugatti Royale, miniature, made of tin, crafted in Malaysia, Franklin Mint, Length 9 cm, weight 125 grams, scale 1:64. With certificate of authenticity. BUGATTI ROYALE. FRANKLIN MINT. YELLOW / BLACK. PHOTO'S MAKE UP PART. ALL OTHER COUNTRIES NOT LISTED. SEE PHOTO'S. ALL AND ANY. NOTHING TO HIDE.